Accounting profit is a company’s net earnings on its income statementIncome StatementThe Income Statement (or Statement of Profit and Loss) shows performance from operations of a business. The financial statement begins with revenues and whereas economic profit is the value of cash flow that’s generated above all other opportunity costsOpportunity CostOpportunity cost is one of the key concepts in the study of economics and is prevalent throughout various decision-making processes. Opportunity is the. This guide will help you thoroughly understand accounting profit vs economic profit, and while they may sound similar, they are actually quite different. Accounting profit is the net incomeNet IncomeNet Income is a key line item, not only in the income statement, but in all three core financial statements. While it is arrived at through the income statement, the net profit is also used in both the balance sheet and the cash flow statement. that a company generates, found at the bottom of its income statement. The figure includes all revenue the company generates and deducts all expenses to arrive at the bottom line. Common sources of revenue include the sale of goods and services, receipt of dividends or interest, and rental income, to name a few. Common types of expenses include the cost of goods sold (COGS)Cost of Goods Sold (COGS)Cost of Goods Sold (COGS) measures the “direct cost” incurred in the production of any goods or services. It includes material cost, direct labor cost, and direct factory overheads, and is directly proportional to revenue. As revenue increases, more resources are required to produce the goods or service. COGS is often, marketing and advertising, salaries and benefits, travel, entertainment, sales commissions, rent, depreciation and amortization, interest, and taxes. Learn more in CFI’s Free Accounting Crash Course. 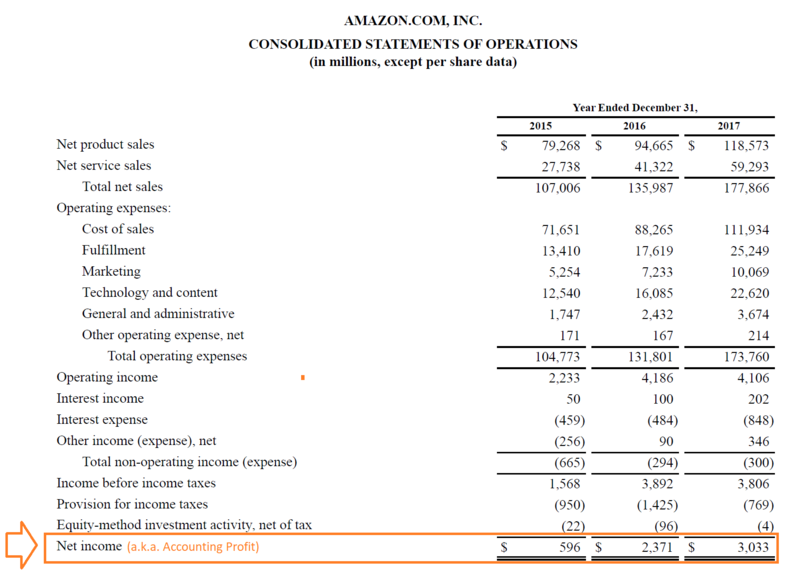 Below is an example, showing Amazon’s 2017 consolidated statement of operations (also known as a statement of profit and loss, or income statement). In the example, you can clearly see how the statement starts with revenue (sales) and then deducts all expenses to arrive at net income (a.k.a. accounting profit). In 2017, the figure was $3.0 billion for Amazon. Learn more in CFI’s Financial Analysis Course. Economic profit differs quite significantly from accounting profit. Instead of looking at net income, economic profit considers a company’s free cash flow, which is the actual amount of cash generated by a business. Due to accrual accounting principles, the figure is often materially different from profit. Furthermore, once the company’s free cash flow is calculated, it must then take into account the opportunity cost that managers of the business can expect to earn on comparable alternatives. Learn more in CFI’s Economic Value Added GuideEconomic Value Added (EVA)Economic Value Added (EVA) shows that real value creation occurs when projects earn rates of return above their cost of capital and this increases value for shareholders. The Residual Income technique that serves as an indicator of the profitability on the premise that real profitability occurs when wealth is. For example, imagine a company has two choices: Invest $1,000 into a new t-shirt product line (Project #1) or invest $1,000 into a new sock product line (Project #2). Project #1 will have revenues of $200 and costs of $125, while Project #2 will have revenues of $300 and costs of $280. Below is an example (simplified) calculation of how to calculate the economic profit of each project. The first step is to calculate the cash flow of each project. For a detailed explanation of how to perform the calculation, see CFI’s Ultimate Cash Flow GuideThe Ultimate Cash Flow Guide (EBITDA, CF, FCF, FCFE, FCFF)This is the ultimate Cash Flow Guide to understand the differences between EBITDA, Cash Flow from Operations (CF), Free Cash Flow (FCF), Unlevered Free Cash Flow or Free Cash Flow to Firm (FCFF). Learn the formula to calculate each and derive them from an income statement, balance sheet or statement of cash flows. The next step is to take the difference between the cash flows of each project and compare them to see which generate more economic profit. As you can see, Project #2 generates a positive economic profit, relative to Project #1. Learn more in CFI’s Financial Modeling Courses.